Download Latest GApps for Android last updated on 18-Jan-2014. Google Apps or the GApps are the first choice for every Smartphone and tablet users while thinking of installing apps as its includes daily usable great apps from Google such as- Google Search, Gmail, YouTube, Google Sync and many more on the list. GApps or the Google Apps package is the proprietary applications of Google which comes preloaded with most manufacturers android devices and can also be downloaded from the Google Play Store. GApps or Google Apps Package Includes: Google Apps or Gapps includes many great apps from Google such as- Google Play Store, Google Search, Google Voice search, YouTube, Gmail, Gtalk, Google Maps, Google Music, Google Sync, Google Docs, Google Backup Transport, Google Currents, Google Calendar, Car Home. All the above Google Apps comes preloaded with Android Smartphone and tablet from most manufacturers and that’s the main attraction of an Android powered device. Without having all these great Gapps installed on your phone, you can’t expect more out of your phone. 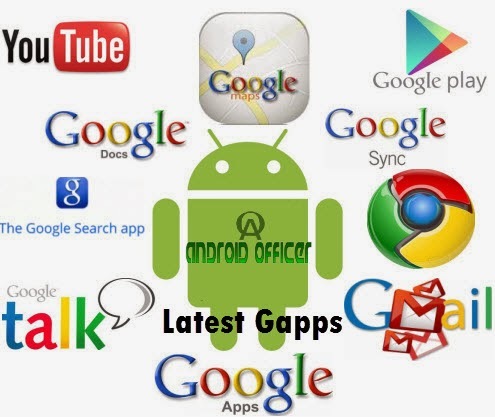 In this article you’ll get all the updated/latest Gapps package for your android phone. But before that you should know that why you need to download Gapps manually while its comes preloaded with android devices. When you need to download Gapps manually? Most android devices come preloaded with Google Apps but sometimes you may need to download and install Gapps manually. After flashing custom ROMs you need to install Gapps package separately as most of the custom ROM developers are not providing Gapps with their ROM. Google Play Store occasionally update apps, you can download the latest updated Gapps package all at a time instead updating each apps separately, that save lot of time. Check out all the updated/latest Gapps package and download for your android device running on KitKat, Jelly Bean, Ice Cream Sandwich or Gingerbread. You’ll also find some special Gapps package for various custom ROM like- CyanogenMod, Paranoid Android, Slim ROMs, MIUI, Backed ROM etc. Check below, and find Gapps for your android version. To install the latest GApps package, your device should have rooted with ClockWorkMood Recovery or CWM Recovery installed. Those who frequently flash Custom ROM, can easily install Gapps package through CWM but if you are new to this then follow the below simple guide as it is. Make sure that your device is rooted and CWM Recovery installed. Install zip from SD card>> choose zip from SD card option. Navigate to the file, select it, choose “yes” when asked. Go to the “advanced” option and select “wipe dalvik cache”. Go back to main menu in Recovery and install the GApps using “install zip from SD card>> choose zip from SD card” option. That’s all. Hope you find Gapps package for your android version and installed it successfully.The list will be updated whenever a new updated GApps package will be available for download. Please report any broken link in the comment. Enjoy your android device with updated Google Apps or Gapps package.